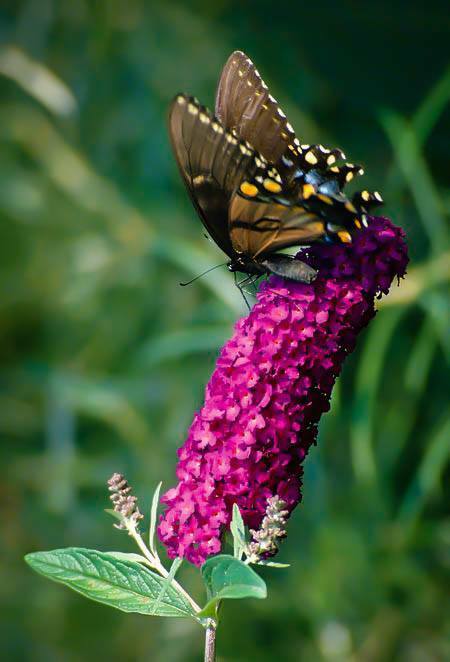 This plant has earned the affectionate name “Butterfly bush” for the profusion of colorful insects it draws, and the Royal Red Butterfly Bush is a spectacular example. With gorgeous magenta flowers in huge cones on a plant that blooms from June through September, it’s the perfect way to add vibrant color to your garden after the spring flowers fade, and your local butterflies will thank you for it too. 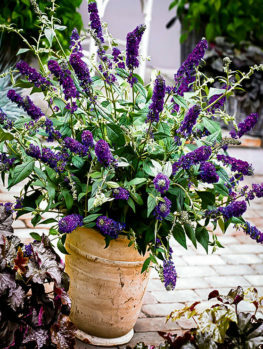 The Royal Red Butterfly Bush is the perfect choice for a sunny corner of your garden, where it will thrive and look wonderful all summer long. Its brilliant rich-red flowers in large tapering bunches at the ends of the branches bring richness to your garden with no effort at all. In many ways flowering shrubs could be seen as the skeleton of a good garden design, bridging the gap between small flowering plants and trees. Get the shrubs right and everything else is likely to follow. Of course it can be tricky to choose the right shrubs, because there are so many to choose from now – hundreds of popular species, and thousands of varieties. 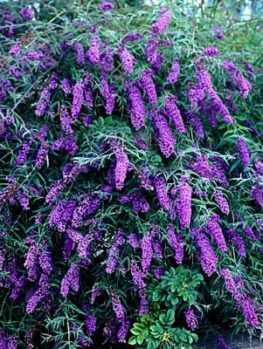 There are some classics that maintain their popularity in the face of all this competition though, and one of them is Buddleja davidii. 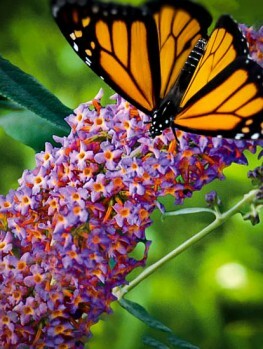 Popularly known as the butterfly bush, this is a vivid flowering plant that’s famous for the variety of butterflies it will bring into your garden. 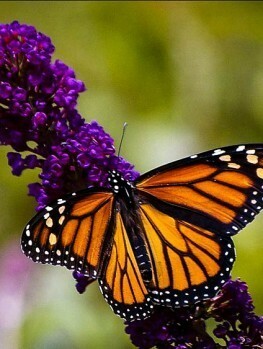 This isn’t just an added touch of beauty; the more butterflies and other beneficial insects you have around the more effectively all your plants will be fertilized. That’s especially good if you also have fruit trees but it’s a benefit for every garden. 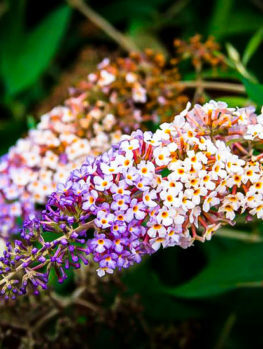 Buddleia is a widely distributed family that’s found naturally on four separate continents – North and South America, Asia and Africa. 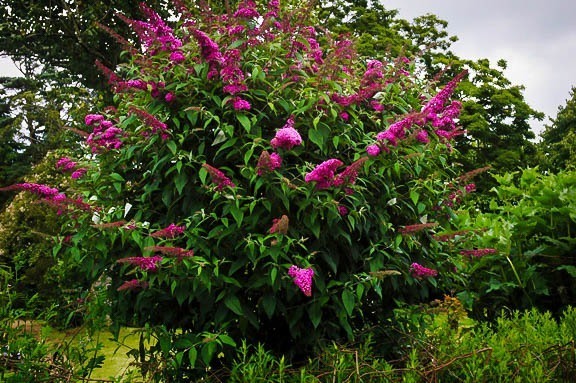 Buddleja davidii is one of the most popular species and it originates from central China. It’s been cultivated for over a century and there are now many varieties displaying different sizes and colors. If you’re looking for a spreading buddleia that won’t grow too high, but produces an absolutely fabulous display of blossoms, Royal Red is a variety you should seriously consider. Royal Red grows to between four and five feet high and about the same width, although if not pruned it can reach up to eight feet high. The leaves are long and slender, more than six inches long and with an attractive gray-green color. The branches are slender and arching, contributing to the plant’s ability to extend itself. The most spectacular feature, though, is undoubtedly the flowers. The flowers first bloom in June and persist until September or even beyond – it’s not uncommon for them to continue decorating your garden until the first frost arrives. The flowers themselves are small, usually about half an inch wide, but achieve their dramatic effect by growing in spike-shaped clusters at the end of each branch. These clusters can be over a foot long so the display of color is truly impressive. 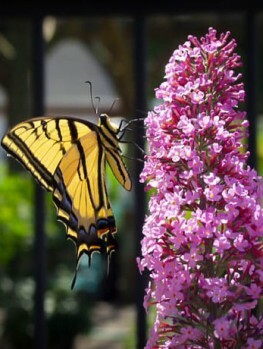 The flowers also have a distinctive and pleasant fragrance, and of course are highly attractive to butterflies. Royal Red is a fairly robust shrub and can be successfully grown in USDA plant hardiness zones 5 to 9. That means it’s suitable for just about anywhere except the extreme north of New England and the Midwest, or the driest parts of the South. Look for a moist but well-drained spot in full sunlight to get the most from its appearance; it doesn’t appreciate either waterlogged ground or too much shade. It also doesn’t suffer from any major disease or pest problems, although nematodes can be a problem in some parts of the South. This shrub does tend to spread out if it’s left to its own devices, so pruning will most likely be part of your plans for it. Pruning can be very radical; it’s a fast grower, so a popular method is to cut it right down to the ground in late winter every year. If you do this it will grow back rapidly in spring and the pruning will encourage more vigorous growth and a better crop of flowers. Gardeners in USDA zone 5 may find that the plant dies off to the ground in winter anyway; just clear away the dead growth and you’ll achieve the same effect. Cutting away dead flower spikes during the blooming season will also promote reblooming. It’s important to be aware that buddleia is notorious for spreading; each of the seed pods can contain up to 50 seeds and they’re famously fertile. Indeed the plant has become an invasive species through large parts of the USA, mostly in southwestern New England and the Pacific Northwest. It’s well established in Hawaii too. In fact Washington and Oregon have both declared it a noxious weed, which we think is a little unfair, but it can crowd out native species. Cutting away spent flower spikes before the seed pods mature will help to keep its spread under control as well as enhancing the plant’s appearance, so don’t neglect this task. Royal Red’s attractive coloring makes it a perfect centerpiece for a floral display, although it’s rarely used as a single specimen. More typically it’s planted en masse as a border, around foundations or to add interest to a rose garden. 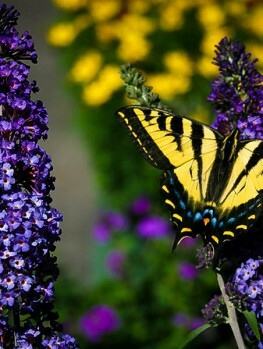 Don’t forget its most famous feature though – consider creating a butterfly garden. An array of Royal Red bushes will form a perfect habitat for butterflies, and you’ll be assured of plenty of fluttering activity through the summer. Overall Royal Red is an extremely attractive and versatile example of the renowned buddleia family and will find a warm welcome in almost any garden. 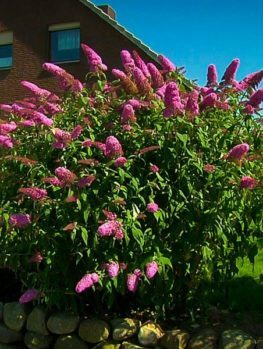 If you enjoy the sight of butterflies, and want to attract bees and other beneficial insects, this is one shrub you really can’t afford to be without! 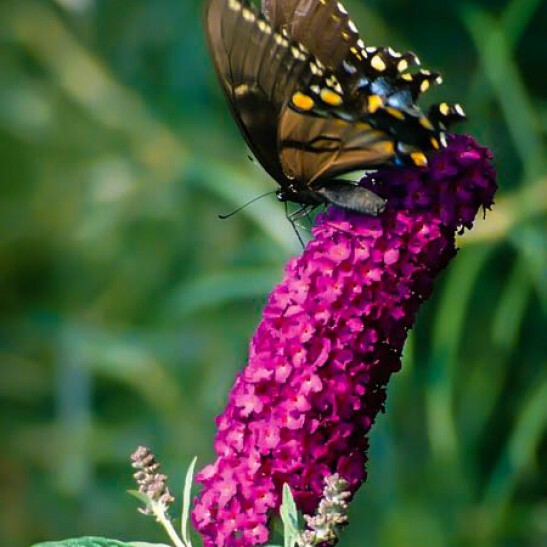 If you enjoy this plant, we encourage you to check out other buddleia varieties, such as the Asian Moon Butterfly Bush or the Pink Delight Butterfly Bush.